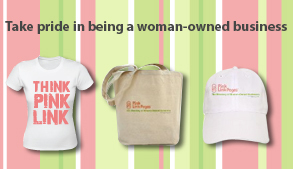 To register and advertise a business in the Pink Link Pages, women businesses owners must certify their business as being majority owned (51% or more) by one or more women and must provide a picture of themselves and their name and title in the business as part of the listing posted in this directory. A) By self-certifying their business as being majority owned (51% or more) by a woman or women (or noting that the CEO of the corporation is a woman) by stating this on the registration form. B) By registering their business with the Small Business Administration (SBA) as a Woman-Owned Small Business (WOSB) or an Economically Disadvantaged Woman-Owned Small Business (EDWOSB) or 8(a). C) By registering their business as a Women Business Entity (WBE) with their State, City, or a national certifying body. WBE certifying organizations are listed under links on the Pink Link Pages website under links. Self certification, WOSB, EDWOSB, 8(a) and WBE certifications are noted on all Pink Link Pages business listings. Businesses choosing to “self-certify” may be subject to verification by a representative of Pink Link Pages to qualify their business as being woman-owned.